Anchor Brewing distributes their Christmas Ale from November to mid-January only, and the tree represented on the artistic label changes every year. The malt and hops used to craft this tasty beer are considered a top secret, but the memorable aroma and taste are secrets that you want your loved ones to discover. 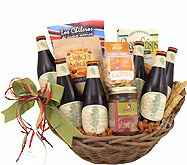 If they haven't yet had the pleasure, deliver three bottles in a basket with gourmet treats. It's the perfect way to add something salty to the sweetest Christmas ever. 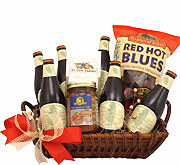 Deliver this beer basket early, and it will kick start the holidays in a memorable way. Or deliver it after Christmas, and it will serve as a tasty start to a brand new year. My brother told me it was the perfect gift, I was so relieved being I don't know much about beers. Reading your reviews , about the beers and the ratings helped me with choosing. It was easy to order and get it sent without any problems. Thank you for helping me pick that perfect gift for him and it being a good quality product. He really enjoyed it! My friends loved this gift! They said it was perfect for their Saturday night bonfire. I'm rating 4 instead of 5 stars because when you send the basket to a couple, it should have four beers instead of three; really, who wants to split the third beer? Not me! Nonetheless, my friends loved it anyway! Your beer gift basket was a hit with my niece's husband, Mark. He enjoys it when everyone is all nestled in their beds ( wife, two daughters, two dogs, two cats and various foster kittens ). I will use your services in the future for other special occasions. My brother loved the basket. Everything in it was very good. It was delivered on time. And being able to track it was great. What a great find! Sent as a Christmas gift to a special friend who is a beer aficionado. He loved it!